Being the first “Made in India” multihead weigher we proudly named it as “INTEGO” these multi head weigher incorporate the entire electrical, electronic, micro-controller system & the software designed & developed by our own R & D team and manufactured in our state-of-the art manufacturing facility. This ensures international quality standards and allows us to provide prompt after-sales-service, quick supply of spares and flexibility in design to adopt changes as per customer requirement. Further we have, in a bid to serve the industry, decided to provide retrofit services. This will help the multi head weighers which are under break down, to swing back into the action. We are open to supply multi head weigher system to OEMs to fit the same on their own VFFS machines. “Made in India” ensures virtual zero down time, means your machine keep working for you 24 X 7. Our nitrogen gas flushing unit guarantees near 100% (More than 99.5%) nitrogen in the pouch. Thus increases the shelf life and quality of your product. Output to capital investment cost is low as compared to peer to peer comparison. 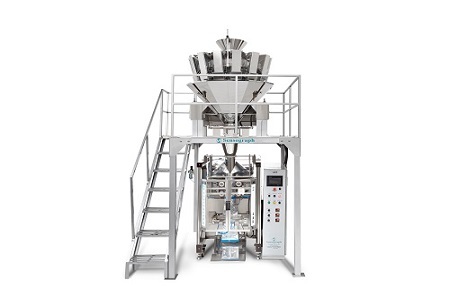 “Made in India” Multi head weigher ensures international quality standards and allows us to provide prompt after sales –service, quick supply of spares and flexibility in design to adopt changes as per customer requirement. Low power consumption thus lowering running cost of machine. Automated sensor system minimizes wastages of film and material.